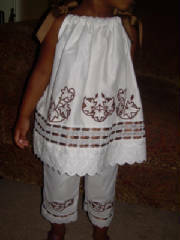 Custom handmade by order, Bone colored Vintage looking Pillowcase Dress and capri pants. 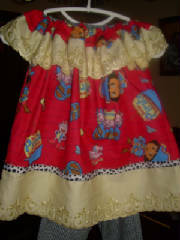 Trimmed w/victorian cluny lace beaded w/red ribbon, and embroidered trim. 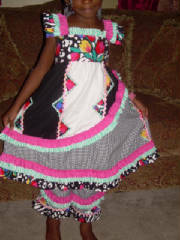 Flower basket design embroidered on front of dress. Choose your ribbon trim and embroidery design colors! 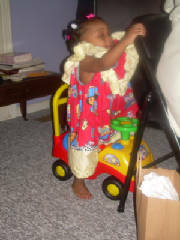 Please measure your child from top of shoulder to desired dress length! 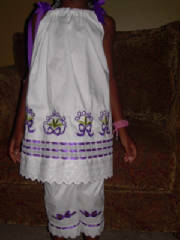 Custom handmade by order, girls beach portrait white peasant pillowcase dress with sleeves and collar and capri pants. 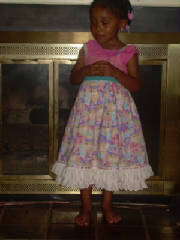 Dress fabric is cotton and sleeves are a semi sheer cotton. Dress has white embroidery designs on front of dress which can be changed to any color. 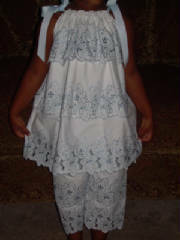 Attached to the white lace is an embroidered trim/lace. 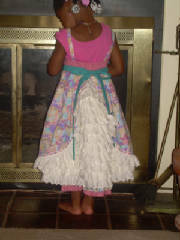 Dress also has an above the waist band that tye in the back. 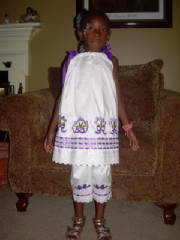 Custom handmade by order, White Beach Portrait Peasant Pillowcase Dress with Collar and Capri/Pants Set. 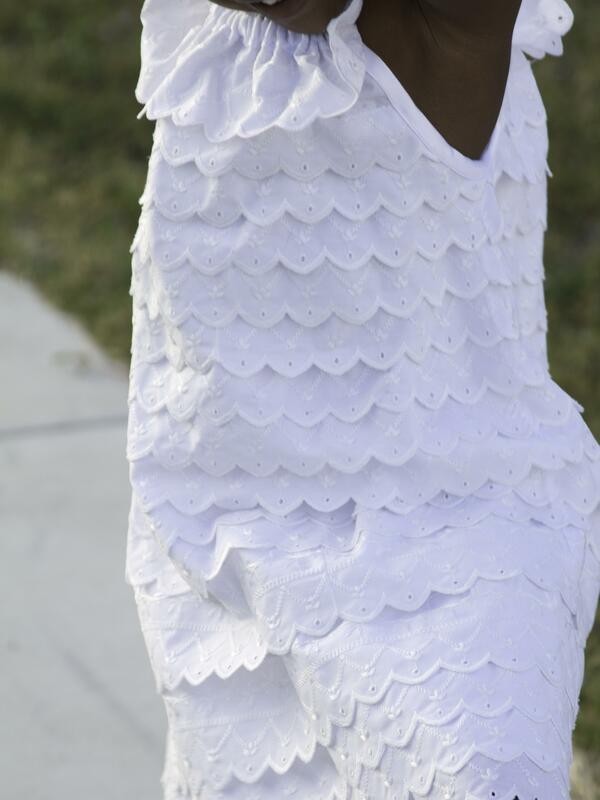 Dress and capri pants have layers and layers of flat embroidered scalloped edge eyelet lace. 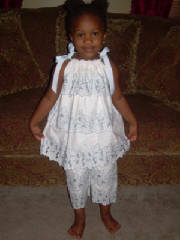 Custom handmade by order, Bunnies, Eyelet and Ruffles Dress and Capri/Pants Set. 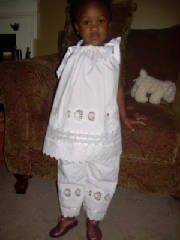 Custom handmade by order, White Beach Portrait Pillowcase Dress and Capri/Pants Set. 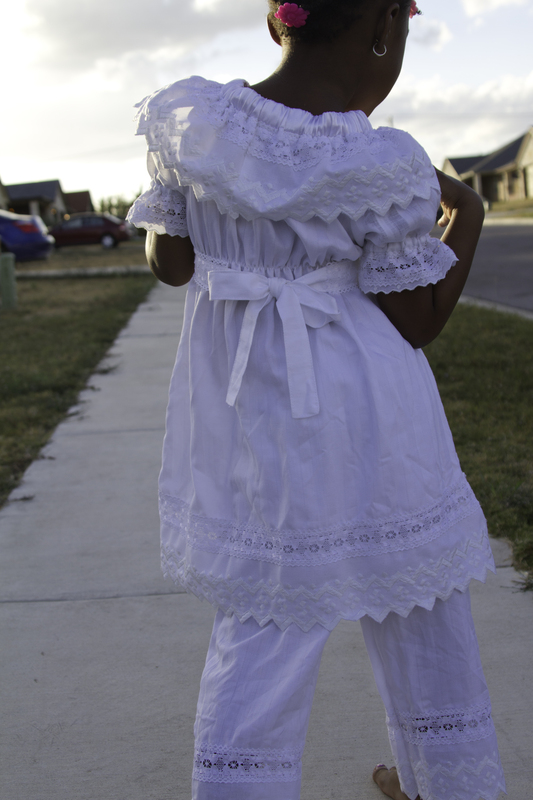 Front of dress has white embroidery cutworks/cutouts hearts designs, trimmed w/white ribbon beaded thru white lace above border & white shoulder ties & is finished w/white eyelet lace on hem/border w/matching capri pants. 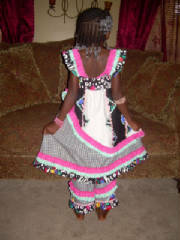 Custom handmade by order, Girls Black & White Sun Dress and Capri/Pants Set w/colorful rows of ruffles and trims. 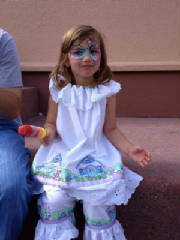 Custom handmade by order, White Beach Portrait Pillowcase Dress and Capri/Pants Set. 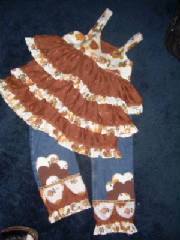 Front of dress has brown embroidery cutworks/cutouts leaves designs, trimmed w/brown ribbon beaded thru white lace above border & brown shoulder ties & is finished w/white eyelet lace on hem/border w/matching capri pants. 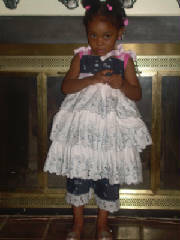 Custom handmade by order, Destroyed Denim and White Twirl Pillowcase Dress and Capri/Pants Set. Layers of ruffles of soft blue cutworks/leaves embroidered on white fabric. 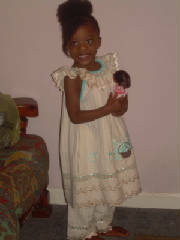 Dress has pink shoulder ties. 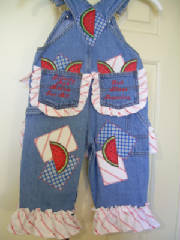 Dress bodice and capri pants are destroyed blue denim. 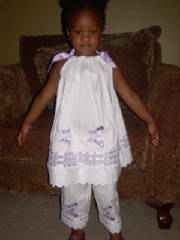 Custom handmade by order, White Beach Portrait Pillowcase Dress and Capri/Pants Set. 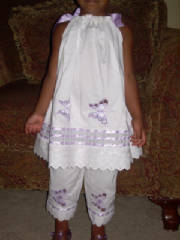 Front of dress has lavender/white embroidery cutworks/cutouts butterfly designs, trimmed w/lavender ribbon beaded thru white lace above border & lavender shoulder ties & is finished w/white eyelet lace on hem/border w/matching capri pants. 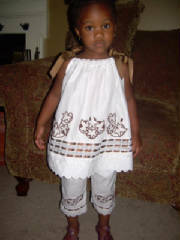 Custom handmade by order, White Beach Portrait Pillowcase Dress and Capri/Pants Set. 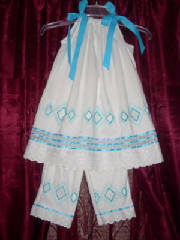 Front of dress has turquoise embroidery cutworks/cutouts designs, trimmed w/turquoise ribbon beaded thru white lace above border & turquoise shoulder ties & is finished w/white eyelet lace on hem/border w/matching capri pants. 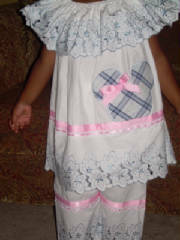 White Pillowcase dress and Capris Set w/soft blue cutworks collar and hem w/Minnie Mouse applique on front of dress w/pink hair bow. 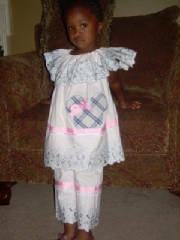 Dress is trimmed w/pink ribbon and white lace. Initials can be monogrammed on Minnie's head. 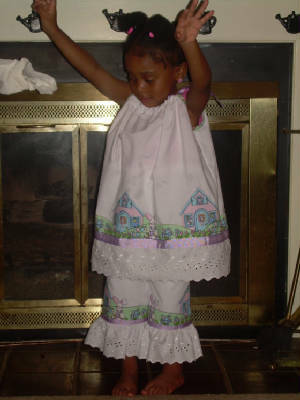 Custom handmade by order, White Beach Portrait Pillowcase Dress and Capri/Pants Set. Front of dress has purple & green embroidery cutworks/cutouts flower designs, trimmed w/purple ribbon beaded thru white lace above border & purple shoulder ties & is finished w/white eyelet lace on hem/border w/matching capri pants. 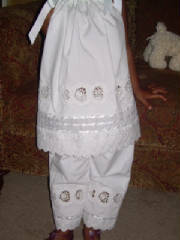 Custom handmade by order, White Pillowcase Dress and Capri/Pants Set layered w/soft blue embroidered cutworks/leaves. 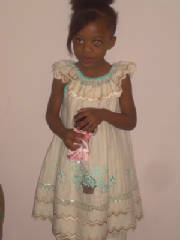 Dress has soft blue shoulder ties. 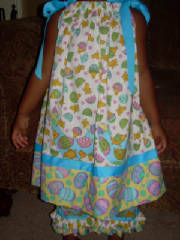 Custom handmade by order, White Pillowcase Dress and Capri/Pants Set w/easter bunny, eggs, houses border. 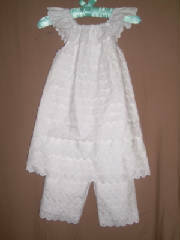 Dress has eyelet ruffles collar and capri pants eyelet ruffles hem. 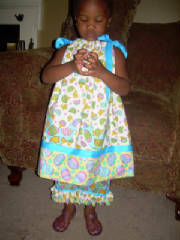 Custom handmade by order, White Pillowcase Dress and Capri/Pants Set w/easter bunny, eggs, houses border. 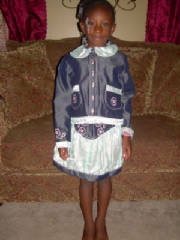 Dress is trimmed w/lavendar ribbon and shoulder ties. 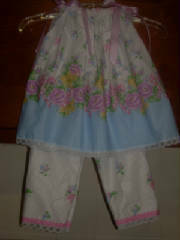 Easter Chicks & Egss Pillowcase Dress and Capri/Pants Set w/two chicken appliques on front of dress. 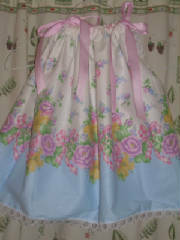 Dress is trimmed w/parakeet blue ribbon and shoulder ties. 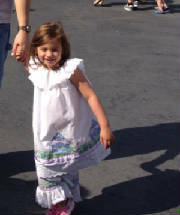 Floral White Pillowcase Dress and Capri Set. 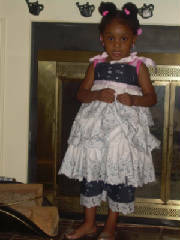 Dress has a floral and blue border trimmed w/white lace. 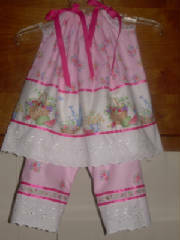 Pants are trimmed w/pink and white gingham and white lace. 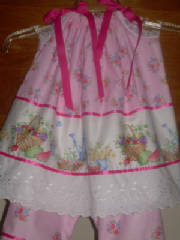 Floral Pink Pillowcase Dress and Capri Set. 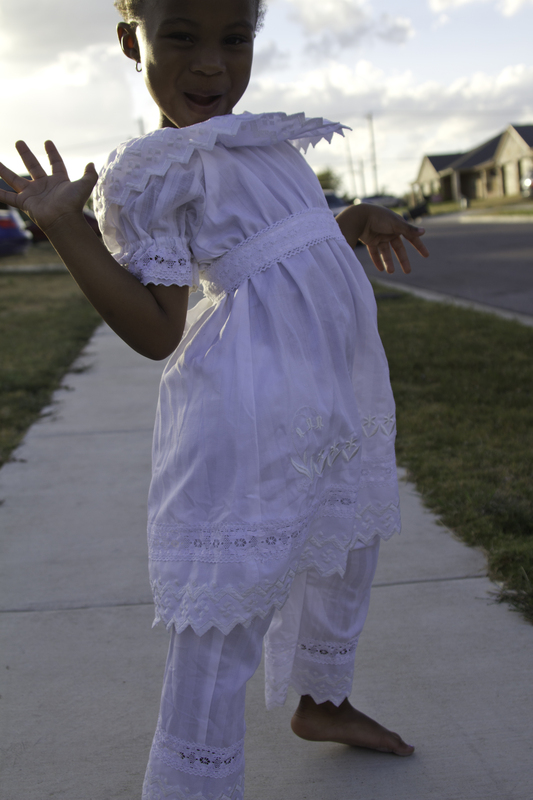 Dress has a garden border above white eyelet lace trimming. 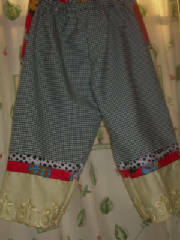 Pants are also trimmed w/white eyelet lace. 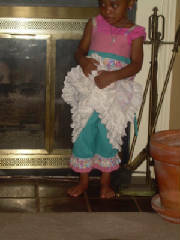 Dress and capri pants have hot pink ribbon trimming. 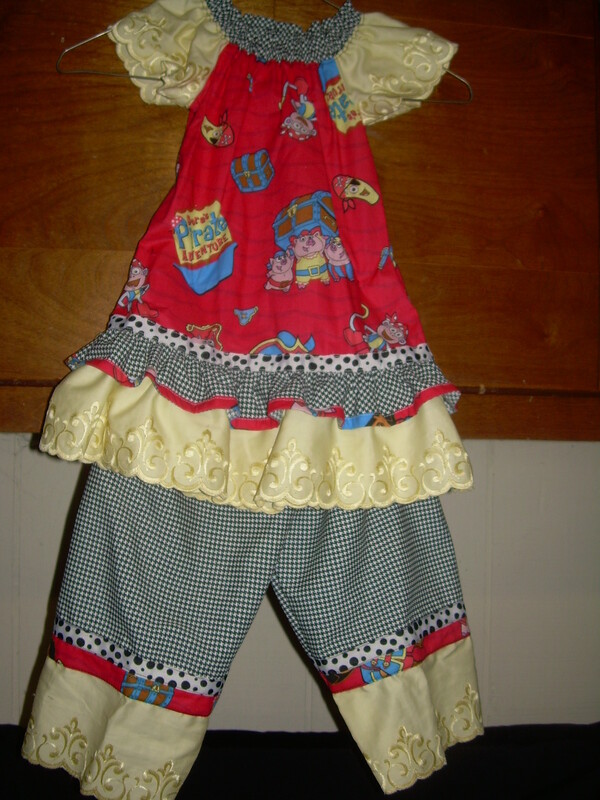 Red Dora Pillowcase dress w/black and white houndstooth Capri Set trimmed w/embroidered yellow sleeves and double ruffled hems. 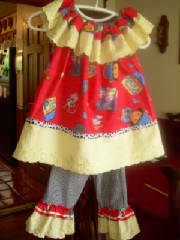 Red Dora Pillowcase dress w/black and white houndstooth Capri Set trimmed w/embroidered yellow ruffles on collar and hem. 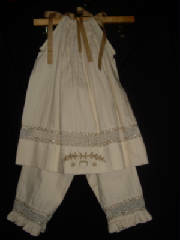 Custom handmade by order, Bone Colored Vintage Looking Pillowcase Dress and Capri/Pants Set. 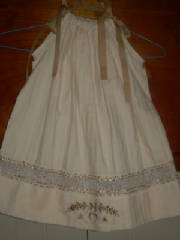 Dress has an/antique looking lace above hem and a light brown design embroidered in hem. 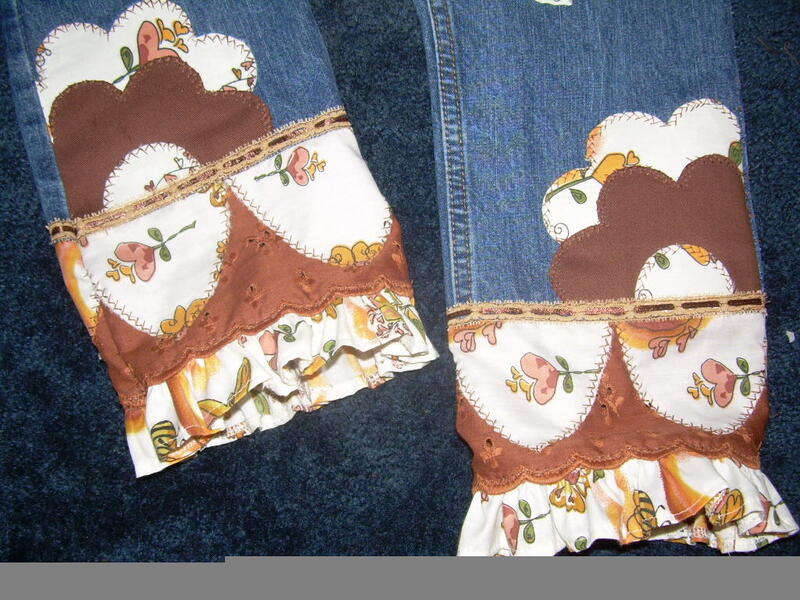 Capris has the antique looking lace w/a ruffled hem. 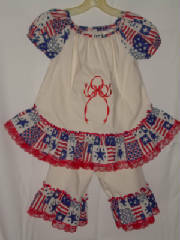 Bone Colored Top and Capris set w/contrasting patriotic trim. 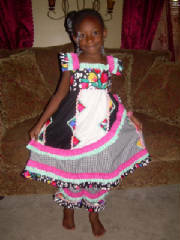 Top can be made with or w/out embroidery design on front. 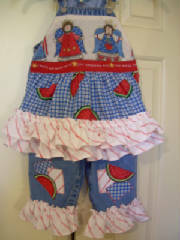 Patriotic Fabric may be different from picture, but will still compliment outfit! Please use measurement chart at top of page when ordering!! 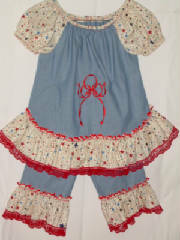 Denim Top & Capris Set w/contrasting patriotic trim. 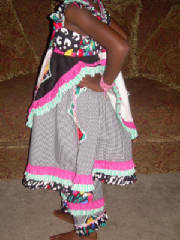 Top can be made with or without embroidery design on front. Patriotic Fabric may be different than pictured,but will still compliment outfit!! Name or Initials can be monogrammed on back pockets! 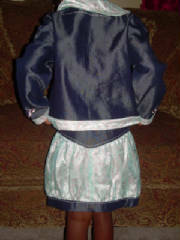 Custom handmade by order, Girls Denim, Lite Jade Green Lace & Pink Satin Jacket & Skirt Set w/your choose between pink or lite jade green for embroidery designs. 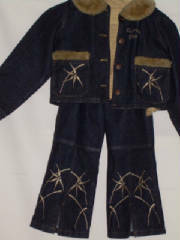 Custom handmade by order, Blue denim jacket and pants jean set w/caramel colored fur trimmings and embroidery designs, w/matching top. 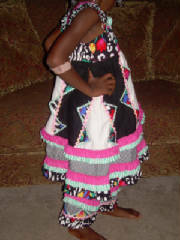 The fur and embroidery designs can be done in other colors. Just ask to see if I have it!